This safari is run based on demand 3-4 times per year. The ride starts at the base camp where you stay for three nights. On the fourth day, you continue to XiDulu camp where you stay 2 nights and ride in the area before continuing further northeast to Garonga. There is a very special atmosphere at Garonga. Over the three days you are there you will get to enjoy all the camp has to offer: massage, bush baths, game drives and private dining. Normally, you take a trail ride in the morning and relax in the afternoon, when you can take a walk or a swim in the pool and enjoy the sunset. You finish the trail ride with a long ride back to base camp and one last night together. 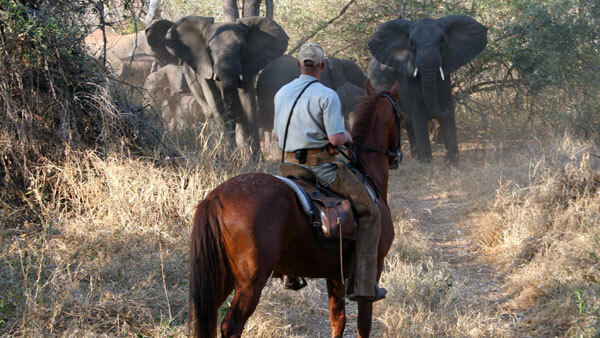 See Karongwe "Big Five" Safari. Today you make your way up towards the northern part of the reserve and the luxurious Garonga camp. Nestled at the edge of a steep cliff with a tributary flowing below, Garonga is totally different from what you have experienced so far. This morning's ride has now taken you over grassy plains, hills and valleys. After several long days in the saddle, you have earned the right to to indulge yourself with an aromatherapy treatment, or maybe a long siesta and an evening drink is more to your taste. There is also a "bush" bath where you can wash off the leather smell while listening to the sounds around you. You can choose how you want to spend the afternoon before you gather in the evening for dinner. Today you head to Garonga. It will be a long day's ride and you will ride across the highest points in reserve. The view is spectacular, and you will realize how big the area around you really is. You head down again, into the wilderness and ride past a waterhole where some hippos are bathing in the water. Your picnic lunch awaits - halfway up in a Marula tree. This is a perfect vantage point to enjoy your lunch at the same time as you watch the wildlife below you. Today you have the chance to re-live your favorite parts of the safari. Maybe you will find some elephants resting in the reeds, or a rhino wallowing in a waterhole. Back at camp, there is plenty of time to rest and gather your thoughts before the afternoon's activities. Even now, it's up to you what you want to do. Maybe take a last journey of discovery on foot, take a ride in the Jeep, or just relax by the pool. A minimum of 5 and a maximum of seven riders.